USC held its groundbreaking today for the Coliseum renovation and announced the official name for the new Coliseum: United Airlines Memorial Coliseum. Maybe they stick “Los Angeles” into their somewhere at least since it has been known as the Los Angeles Memorial Coliseum. Thankfully, “Their Somewhere” is not My Somewhere! In Los Angeles your somewhere can be where ever you want it to be. USC sure is selling itself out to be ordinary, first the football program and the university going on the cheap with Clay Helton and now turning the Los Angeles Memorial Coliseum into just another stadium. Never thought I would see the day when USC would not do all it could to pursue excellence, strive to keep its illustrious pedigree up to historical high standards. Hey wolf, is that you, breath smells the same? So everybody lied when they said United Airlines was only getting field naming rights? What’s new at bozo u? Why would anyone want to fly united? They charge extra now to drag you off the plane. So that leaves Alaska Airlines who is rockin it with good fares and great service. Even let get by being 2 pounds overweight on a bag. Unfortunately, their 115+ destinations don’t include Europe and Asia, so I haven’t had the pleasure. Alaska does have mileage partners which can get you to Europe. I’ve flown British Airways and Air France on Alaska miles. Odd. British is part of AAdvantage (American Airlines)/ oneworld airline partners, while Air France is with United is with Star Alliance. Either way, my point is that most of my flights are to Europe and Asia, so I never fly Alaska Airlines to have miles with them to use with partners. Well it was 10 years ago. I’m in United mileage plan now. As recently as 2006, Season Ticket Holders used to get moved to accommodate the VIP’s from Notre Dame. Didn’t she want to fly for free? Imagine the precedent if United let her fly free. Then people would be using such excuses to get free flights. BTW, I’m a Captain for United Airlines. She had a ticket there was some snafu with the ticket, but she was on the plane and removed. You should know you cannot (or under normal circumstances) get on a plane without a ticket. The crew should have handled it better. I’m glad I don’t have to deal with these kind of things. Well rey rey when did you become a captain United??!! You were a baggage handler for Aero California at McCarren airport in Vegas! My my. A personal attack by a TROLL when I was not attacking anyone. How predictable and disgusting. Ted was awakened from his nap early by one of his roosters and was in a bad mood. Yep. His 1st cousin/wife left the coop open again. “Nobody flies for free.” Seems reasonable to me. I guess that’s why I’ve been paying all these years and never got kicked off a plane. I was gonna say something about dragging, but then I forgot, so thanks. Oh I remember now, this new name is a drag. Is your food going to get worse, too? Stick “Los Angeles” into their somewhere. What? That would be “Los Angeles of Inglewood” like Los Angeles of Anaheim, eh? As usual you did a half a#s job. How much is United donating to USC? Why are they season ticket holders having to pay $500 per seat for the renovation? How much is the renovation? Is the State, County, and City helping with the bill? Too many questions about this and you are at your mother’s house in the basement playing with your gerbals. Terrible. It had to be “The Los Angeles Memorial Coliseum and United Airlines Field” – or something to that effect. Sorry, Max – you blew this one….. I like the sound of UA-LA Memorial Coliseum…almost sounds like a chant from one of our Polynesian brethren or close to “ooh-la” sound when our fans see that another top ranked recruit commits to SC over UCLA. United, if they are paying, would never want to just use “UA.” That could mean United Artists, Ultimate Alliance, etc. Actually, the more I think about it, nobody is going to call it the United Memorial Coli. It’ll be the Coliseum. Not like Staples Center… Screw United. Glad SC has the Cash. The Fight On United Airlines Field at the Los Angeles Memorial Coliseum still has a nice ring to it. Looking at the picture of the renovation, it is going to be amazing that they will be able to play there in 2018. A LOT of work to be done just to get seats on the south side in less that a year. Wonder what the temp press box will be like and if they will have donuts for Wolf. 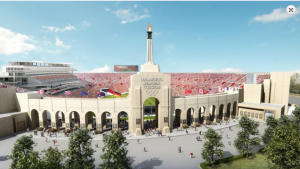 Max Nikias has turned the Los Angeles Memorial Coliseum into a groveling, begging & pandering for attention sellout of a facility just like his own pathetic self. Crazy times.. Maybe they should add runway lights to the playing field.. Umm.. That would be the ultimate finish to that crap house.. We are better than this.. Sad! Put a damn gate on the 10 yard line. Agree. USC is better than this. Are they still going to call it the coliseum? I’m going to suggest calling it the United Airlines Sportatorium. It’s much more than a football stadium as it’s been the site of the World Cup, Olympics past present and future, Goodwill Games, an episode of wipeout, The grateful dead played there man, The X-Bowl was played there when our LA X-Treme won the first ever XFL championship, the dodgers used to call it home, The LA Kings played an exhibition game there, and on 4th of july man o man is that some firework action. The Sportatorium fans. It’s not just for football. Don’t care what they name it, it is and always will be THE L.A. Coliseum. Period. 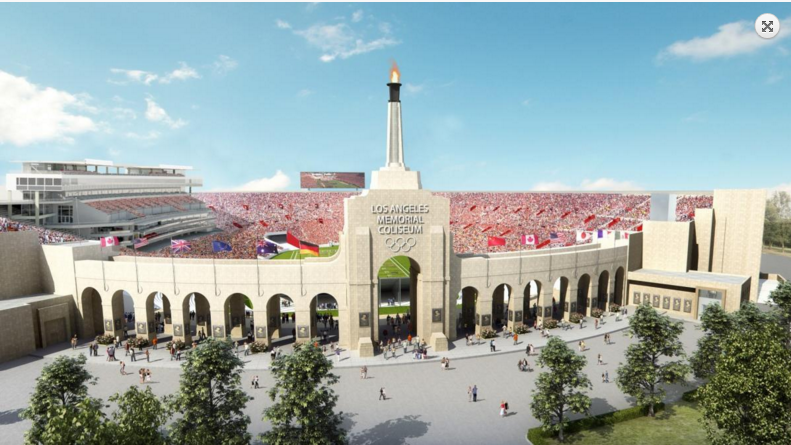 No – it is ‘The Los Angeles Memorial Coliseum’ first dedicated to the soldiers who fought in World War 1 back in 1921. To omit the name of ‘LA’ from its’ ‘official’ name is criminal. It is the sole stadium left in the entire USA that has such a pedigree of historic events, moments in time and athletic competition second to none….all the other renowned great stadiums are gone – Soldier Field (what those ‘bauhaus’ clowns did to its’ exterior is unforgivable)… Kezar and JFK Phil – both gone (1989). Comiskey Park gone 1991 ,Tiger Stadium demolished 2008 Yankee Stadium in 2010. The LA Memorial Coliseum is the last of the old giants not located on a college campus still standing – thankfully MI, OH St. NE, PA St., AL etc. have theirs intact…notre dame was altered seriously increasing it’s seating capacity and has never had the standing of the other great old football stadium except for its’ fans. Second favorite stadium name in the World. The Coliseum is literally an awesome place! So great to see USC rebuild the uber-famous structure itself as well as the surrounding area. southern cal is as southern cal does… you claim to be a private institution but use a publicly owned stadium at a fraction of the market price!! City of LA ought to throw you out! Bunch of freeloaders who act all high and mighty! Too bad Buckwheat. Hah, hah, hah you dimwit. USC’s making the Coliseum great again while when under the derelict, financially irresponsible reigns of Los Angeles and Calif, it was left to fall into a forever unimproved state. USC is literally saving and modernizing the Coliseum for itself and a 3rd Olympic Games. Being a stupid little gutty, this is too hard for you to understand – which is why you are a ucla idiot Troll. Hah, hah, hah. The decrepit Rose Bowl, where you lackeys stumble around, stinks by the way. Thank God USC only has to play there when we are constantly winning Rose Bowls in January – the month when little ucla is always banned from the site. Just was is Sc thinking Wolfie??? The Western Kentucky Trojan Hilltoppers of Sourhern California…has nice ring to it, right Max Nikias, you tradition killing money grubbing begging and pandering groveling clown! Somebody’s jealous his school didn’t get none…aww schucks..
You say you graduated from USC and yet more than half the time you’re not smart enough to use spell check. Most of your posts look like they were written by a 3rd grader. Well since you almost made it to third grade, I reckon i’s got to dum it down some more. You’re stuck on stupid all the time, I guess that’s for the benefit of all the other idiots like you in this forum, right? You know stupid.. only time I’m stuck on it is talking with you..lying and misrepresenting facts..and thinking you’ll get away with it.. that’s stupid. Bunch of clowns running things at USC these days. Nikias is just a stooge. Decisions like this are made by as#holes like Ed Roski. When can we expect completion? It’ll be fully restored and modernized in time for the 2020 season. I thought all seats would be available for the 19 season. They will. Construction occurs around the seasons. Not only is Max Nikias who_ring himself out…he’s selling USC out. Hey idiot!…..USC doesn’t own the the Coli. Hey idiot, in 2013 USC signed a 98 year lease to manage the coliseum. Now shut your stupid trap. “Now shut your stupid trap”….right back at you. Amazing he doesn’t know the difference between fee ownership and a leasehold. Doesn’t matter. TO is just a drone. Still having reading comprehension problems, huh? And then you make yourself look even worse by listening and agreeing with stupid when she doesn’t know what she’s talking about. Your mama ever break you from sniffing at trees and fire hydrants?? No one said it did, but nice effort trying to redeem your stupid self. How about proofreading your post? Perhaps you should try spell and grammar check before posting. 70 million! Woo hoo! Fly the Friendly Skies! Can’t wait for the massively modernized Coliseum to open for Trojan football in the future. Gonna be awesome. Maybe they’ll put in some new benches in Exposition Park for you to sleep on at night and you get get up off the curb or gutter, wherever it is your laying your head at night. This is just horrible. There better be a TON of backlash from alumni and fans. United Airlines Memorial Coliseum of Los Angeles anyone? Ewwww. There hasn’t been much of a backlash from the USC alumni as Max Nikias has lowered the standard for Trojan football by allowing it to be run by a second rate head coach, I doubt there will be any backlash due to Nikias selling out the Los Angeles Memorial Coliseum to corporate sponsorship. It is just a name from the highest bidder. Thankfully that money may have saved season seat holders thousands. USC Trojan football fans won’t have to worry about Nikias or Helton selling out naming rights to the UFC or MMA entities for Howard Jones Field…there’s no physical contact allowed on the practice field. Scooter, does this mean Usc will fly United instead of delta? Also, will Usc get a discount for flights? Get on this.